Lack of true configuration reload support made managing our 20+ load balancers cumbersome. We had a solution (hack) in place, but it was getting to be a pain. When something would break on the backend and cause 20-50k connections to pile up, the thread creation would cause huge load spikes and sometimes render the servers useless. As we started to push 700-1000 requests per second per load balancer, it seemed things started to slow down. Hard to get quantitative data on this because page load times are dependent on so many things. So… A couple weeks ago we finished converting all our load balancers to Nginx. We have been using Nginx for Gravatar for a few months and have been impressed by its performance, so moving WordPress.com over was the obvious next step. Here is a graph that shows CPU usage before and after the switch. Pretty impressive! Can also be used as a web server, which allows us to simplify our software stack (we are not using nginx as a web server currently, but may switch at some point). 2 application servers (in 2 different data centers for redundancy). One of these servers primarily handles the main Gravatar website which is Ruby on Rails while the other serves the images themselves. If either of these servers or data centers were to fail, we could easily switch things around to work around the outage. 2 cache servers (1 in each datacenter). These servers are running Varnish. They cache requested images for a period of 10 minutes, so frequently requested images are not repeatedly requested from the application servers. We are seeing about a 65% cache hit rate and about 1000 requests/second at peak times, although as adoption of the service increases, we expect this number to go up significantly. 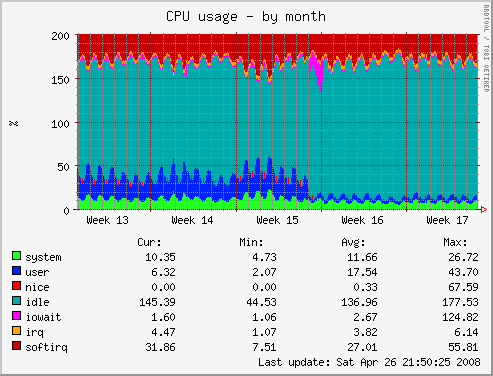 A single server running Varnish can serve many thousands of requests/sec. The amount of data we are caching is small enough to fit in RAM, so disk I/O is not currently an issue. On the hardware side, for those of you who are curious, we are using HP DL365s for the application servers, and HP DL145s for the caching servers. 4GB of RAM and 2 x AMD Opteron 2218s all around. The application servers have 4 x 73GB 15k SAS drives in a RAID 5, while the caching servers are just single 80GB SATA drives. We use the same hardware configurations extensively for WordPress.com and they work well. Previously, the service was using Apache2 + Mongrel to serve the main site and lighttpd + mod_magnet to serve the images. We decided to simplify this and we are currently using lighttpd to serve everything and it is working well for the most part. 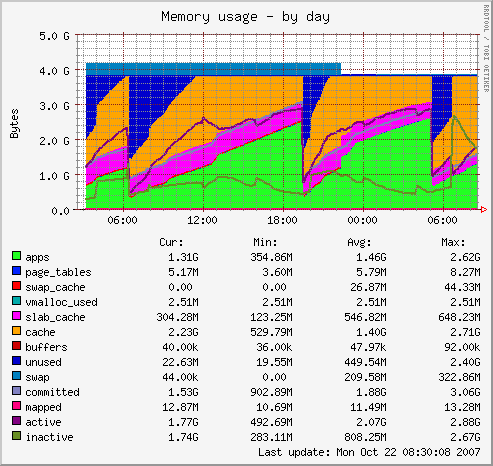 We seem to have a memory usage issue with lighttpd, which may be related to this long-standing bug. For now, we are just monitoring memory usage of the application with monit, and restarting the service before memory usage gets too high.